Getting a divorce for anyone can be an emotional process. You have to dismantle the life you created together, go through a custody battle if you have kids, and divide up all of the assets you accumulated with each other. While a divorce can be bittersweet for some and heartbreaking for others, it can get more severe if one of you or both of you are immigrants living in America. If you moved to America to be with your spouse who is native to the States, you may be asking yourself whether you’ll be able to stay here. If both of you are immigrants who moved to the country together, you’re probably wondering if you should talk to an immigration lawyer or you should go to a divorce attorney. 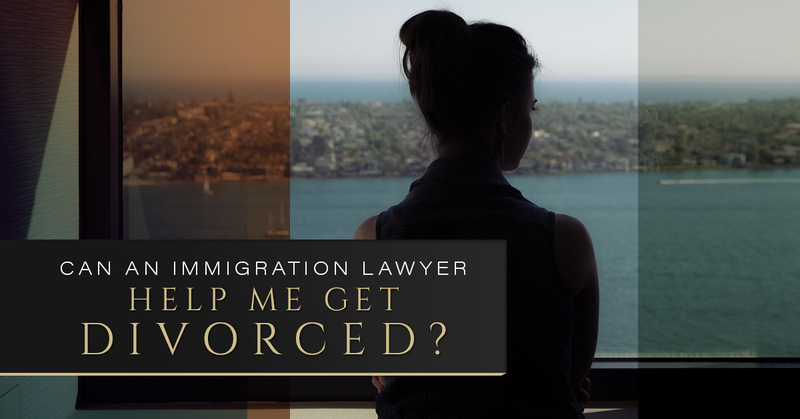 In today’s blog, we’ll be discussing whether you should go to an immigration lawyer for help on your divorce and the information you should be aware of as you go through this emotional process. For more information, take the time to visit Zohar Law PLLC. Can an immigration lawyer help me get divorced? The answer can be a tricky one. Generally speaking, for those who are going through a divorce, you should always go to a divorce attorney. Divorce attorneys focus on family legal matters and have the knowledge and the experience that’s needed to ensure that your rights are protected. He or she can also help you with any custody battles when it comes to your children as well as alimony and child support. An immigration lawyer will help you with anything immigration related such as getting a visa or bringing family over from another country. However, with a murky issue such as immigration and divorce, it depends on the situation. If you’re native to this country but your spouse is not, then you will only need to deal with a divorce attorney. If you’re an immigrant and you’re trying to figure out if you can keep your visa while getting divorced, it’s best to talk to an immigration lawyer. Keep in mind that every situation is different and if you’re unsure, then stop in for some assistance at our law firm. Can Divorce Affect An Immigration Status? If you’re an immigrant and you’re wondering whether your divorce will affect your immigration status, then the answer is yes it can affect your immigration status in one of three ways. What it comes down to is you and whether you do not have a green card, if you have a conditional green card, or if you have an unconditional green card. If there’s not a green card in your name, then it can affect your immigration status. If you do have a conditional or unconditional in your name, then it can also affect the status. This means that if you don’t have a green card, then you’re not eligible for permanent resident status through your former partner if the marriage ends. As for a conditional green card, then a divorce can complicate your ability to turn a green card into an unconditional green card. You’ll need to file a Petition To Remove The Conditions Of Residents, which an immigration lawyer can help you with. You’ll need to adhere to criteria such as a good-faith marriage prior to the divorce and abuse that occurred in a good-faith marriage to be able to waive a joint filing requirement. Lastly, for an unconditional green card, a divorce or an annulment will not actually impact your immigrant permanent resident status negatively only if you have one. However, due to the length of a divorce, it could take longer for you to become a U.S. citizen. Once a divorce has taken place, it can be difficult to get back on track for to become a U.S. citizen if you don’t have an immigration lawyer. During a marriage, an immigration application is generally pending before the USCIS and when a marriage is dissolved, then the spouse who is an immigration will be seen as out-of-status. This means that the spouse who is an immigrant has a strong possibility of being removed from the proceedings when a divorce is finalized. In addition, if the marriage is less than two years old and an immigrant moved here for marriage, then he or she will be given a conditional permanent residence. After two years, then the immigrant will be given a full permanent residence. Additionally, if the marriage ends in divorce, then it’s possible that the spouse who is an immigrant can be deported and lose the immigration status. However, it all comes down to the amount of time the marriage occurred and whether the marriage was in good-faith. If you’re getting a divorce and you’re an immigrant, then don’t wait to contact an immigration lawyer today.